Whether you have kids, pets, or both, chances are when you’re in the kitchen, that’s where they want to be also. After all, the kitchen is where the food is…though maybe they enjoy your company a little, too! Kitchens are often the hub of all the activity that occurs in a home, and if you’re considering a remodel, it’s a good idea to design a plan that accommodates your kids and pets. Doing so can help ensure that your kitchen not only looks great, but stands up to wear and tear, conceals clutter (and finger and paw prints), and provides a safe hangout spot for your kids and pets. Spilled juice. Broken dishes. Muddy paw prints. Hairballs. Trails of dog slobber the size of the Mississippi. With kids and pets, these things are bound to happen, and your floor needs to be able to stand up to it. 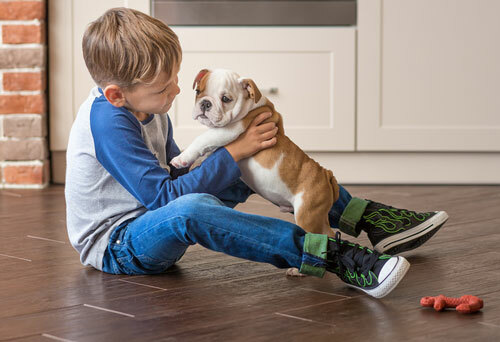 Ideal flooring for kids and pets should be resistant to stains, scratches, and water damage, and be able to withstand impact from dropped objects such as heavy toys or shattered glass. Good flooring choices include porcelain or ceramic tile, resilient vinyl, and linoleum. Although durable, none of these options is as comfortable as carpet for napping pets, crawling toddlers, or your tired feet after a long day at work. Investing in several good quality slip-resistant rugs can provide extra comfort and warmth. Make sure they are machine washable so you can easily toss them in the laundry when messes do occur. If you have pets, it’s also a good idea to choose a floor color that will conceal pet hair as much as possible. If you have a black dog that sheds constantly and you install a white tile floor, any amount of hair will be clearly visible. The same goes for a white cat and a dark floor. Unless you have a robotic vacuum, you’ll be spending a lot of extra time sweeping that very noticeable pet hair off the floor—and you’ve got better things to do! It’s a given that you want your new kitchen to look great well past it’s debut. But what you don’t want is to have to be continually fussing to keep it that way. Choosing surfaces wisely can make a huge difference in the amount of time you spend polishing your kitchen. For countertops, black or very dark shiny surfaces such as granite will forever reveal fingerprints, smudges, and water rings. Even wiping them down with a damp rag can leave visible streaks. White or extremely light countertops can—depending on the material—easily show stains such as spilled grape juice or an abandoned popsicle that melted on the counter. Choosing countertops with some degree of variegation can help conceal imperfections. Materials such as quartz and laminate are durable, stain-resistant options for busy families, and both have limitless selections when it comes to variegated patterns and colors. For backsplashes, choose a material that is easy-to-clean and water resistant, such as porcelain, ceramic, or glass tile. Walls are easily scrubbable when painted with a semi-gloss or satin paint. As far as appliances go, black stainless steel is an increasingly popular option for parents who want the look of stainless without the hassle of constantly wiping fingerprints and smudges. There are several things you can do to make sure your new kitchen is as safe as possible for kids and pets. Homework station. While older kids may prefer doing homework in the quiet of their rooms, younger kids often end up doing their homework in the kitchen where they can be around other family members. If you’ve been battling an unending pile of school supplies, papers, and books scattered about your kitchen table, consider adding a small built-in desk in your kitchen to serve as a designated homework spot for younger kids. It could even be built with a pull-down door to conceal unsightly clutter and supplies when not in use. If you have the space for two islands, a second island can be an ideal spot for kids to do their homework and eat their after school snacks while you use the other island for food prep. Drawers and storage inside the island can then be used to organize papers and supplies. Pull-out snack drawers. Custom, pull-out sections inside cabinets and pantries work great for storing kids’ snacks and school lunch items, keeping them safely within reach. Built-ins for pets. Many modern kitchen designs are featuring built-ins for pets, such as pull-out dog food or treat storage or pet food bowls that slide into a drawer or island when your pet is done eating. If your dog or cat loves to lay around in the kitchen while you’re cooking, you might even consider building a pet bed into an area under an open cabinet or shelf. That way, you’ll be less likely to step on a tail or trip over your pet as you rush around the kitchen. If you’re thinking about starting a kitchen remodel and want to include kid- and pet-friendly options, ask us how we can help!